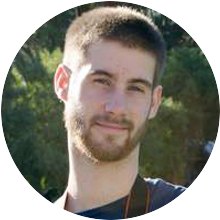 Taking a five week Southeast Asia trip wasn’t always part of the plan for our gap year. In fact the only reason we went was because a friend convinced us to go after sharing stories from his own trip there. It wasn’t the cheapest trip, but it also wasn’t too expensive when you consider everything we did and how long we were away for. It’s a common misconception that travel is expensive. So much so that one of the most frequently asked questions we get about our gap year is how can we afford to travel so much (let alone pay my student loans at the same time). But the truth is, travel doesn’t have to be expensive. Sure, if you stay in a hotel each night and eat out for every meal the costs will add up quickly. And in most cases the people wondering how we can afford to travel are probably considering the typical expenses they pay on their own vacations. But by picking the right destination and planning properly, travel can be cheaper than your daily expenses back home. In the case of our 5-week Southeast Asia trip, we were able to find reasonable airfare to/from Bangkok and had a favorable currency conversion rate; but choosing to visit during peak tourist season drove our costs up a bit. Even with it being the high season we spent far less per day traveling in Southeast Asia than we had living as a college student in the U.S.
Daily expenses in Southeast Asia are low compared to back home in the United States. In fact, nine of the top-20 world’s cheapest cities to travel to in 2016 are located in Southeast Asia (we traveled to three of them: Hanoi, Chiang Mai, and Bangkok). For comparison, only ten U.S. cities made it in the top-135! 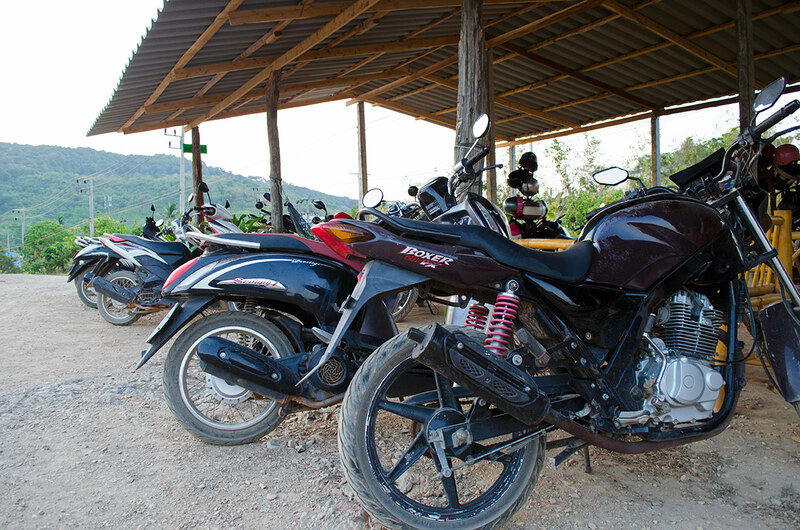 By far, the largest expense during our trip was transportation, even if you take out the flights to and from Southeast Asia. All in all, this expense includes 7 flights, 5 minibus trips, 11 taxi rides, 6 tuk tuk rides, 2 ferry rides, 2 longboat rides, several days of scooter rentals and a handful of times on Bangkok’s BTS lines. Round-trip tickets from New York City to Bangkok cost us $805 each, for a total of $1,610. However, we should point out that there were cheaper flight options. At one point we saw a China Eastern flight for $625 each round trip, but opted instead to fly with Korean Air for superior service and better departure/arrival times. 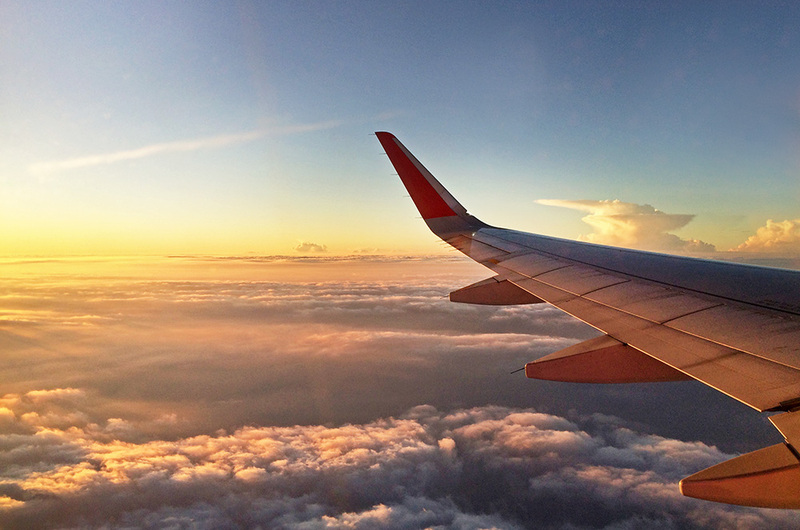 Price factors to consider include: how early you buy your tickets, which airline you choose, the city you want to fly to, and the number of stops along the way. While the flights accounted for $2,663.97 of our budget, the rest of our transportation only came to $205.17. 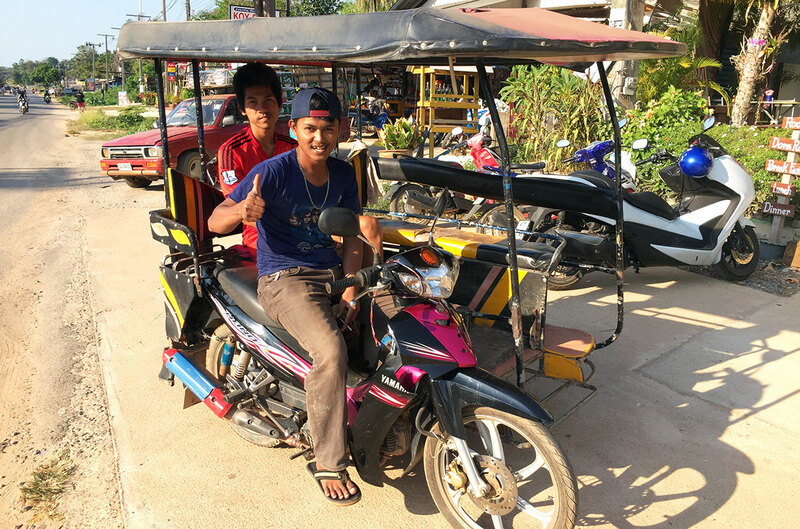 Taxi rides cost us anywhere from $5-10, minivan tickets cost $9, ferry tickets cost $8, long boat tickets cost $6, scooter rentals cost us around $9 a day and the BTS was roughly $0.75 a ride. Add it all together and transportation cost us $2,869.14 total. After transportation, the second largest expense for our trip was accommodation. 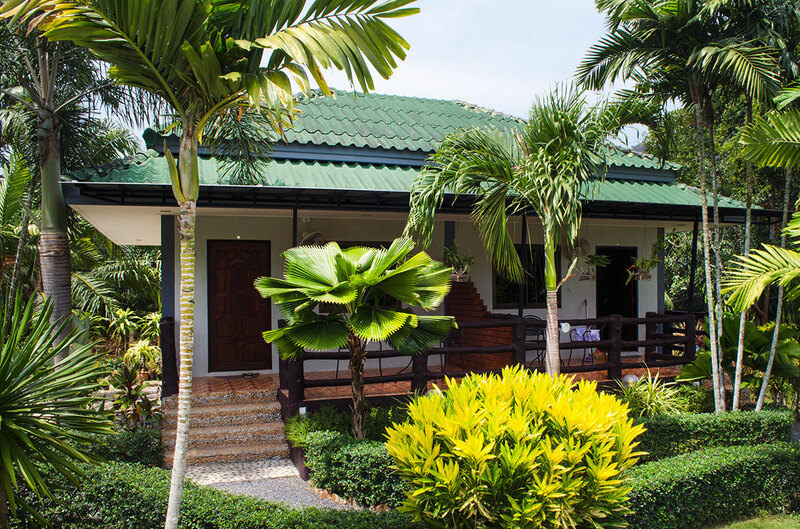 There are a wide range of options when it comes to finding a place to stay in Southeast Asia, including hostels, guesthouses, bungalows, resorts, and the traditional hotel room. By the end of our trip we had stayed at each of these options at least once! How much you spend on accommodation really depends on your goals. Hostels and guesthouses are great if you are looking to meet other travelers and want to spend as little as possible. But there are also plenty of options if you’d rather have a private room at a reasonable price. At the beginning and end of our trip we used Airbnb to find a room in Bangkok. 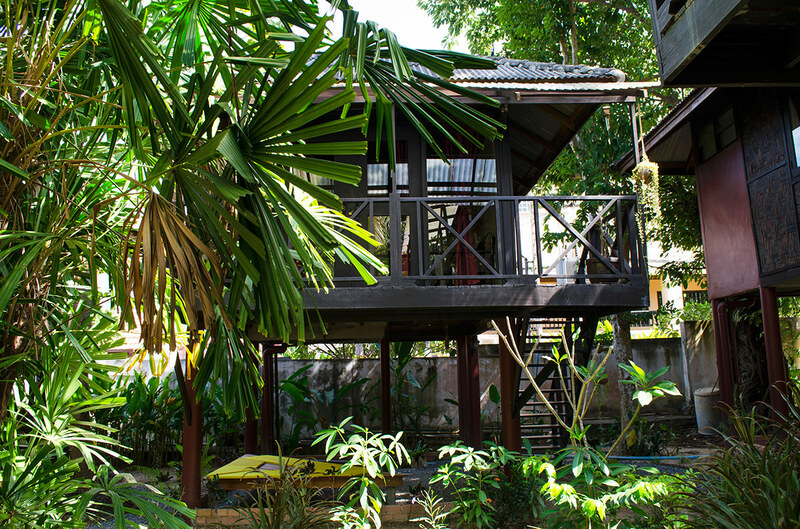 We stayed at our first hostel in Chiang Mai, our first bungalow in Pai, and booked a hotel room at Bangkok’s Don Muang Airport in order to catch a 6:00am flight. For our trip we chose to spend a little extra each night to have a private room and the occasional A/C. We also decided to splurge from time to time, choosing to stay in a “resort” every few weeks. As a result we ended up spending an average of $32.75 per night, for a total of $1,211.75. Our advice is to first decide what your goals are, then spend some time researching your options across a few websites. For the most part we used Booking.com to find our accommodation. However, Agoda is another great option when traveling to Southeast Asia. Whether you are home or on the road, you have to eat. When it comes to traveling that usually means you need to eat out for each meal (that is unless you rent an Airbnb that has a kitchen). Thankfully, food is both cheap and plentiful in Southeast Asia. 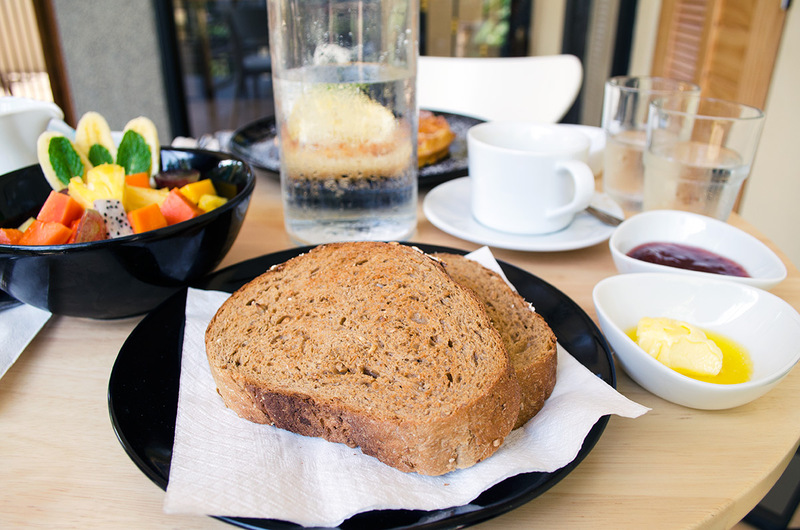 Our typical breakfast in Southeast Asia consisted of toast with jam and a sizable portion of fruit. Not only was the pineapple and watermelon some of the best we ever had, but eating a simple breakfast each day helped to keep food costs low. The most expensive meal we had in Southeast Asia cost us $40, which included an appetizer, two entrees, drinks and two deserts. On average a good-sized meal for two at a restaurant in Thailand set us back $10-15. 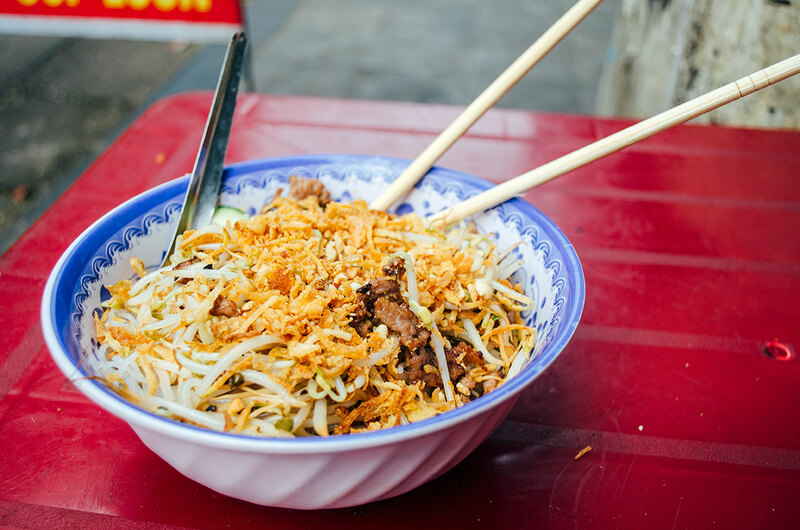 However, some of the best food you can find in Southeast Asia is on the street. 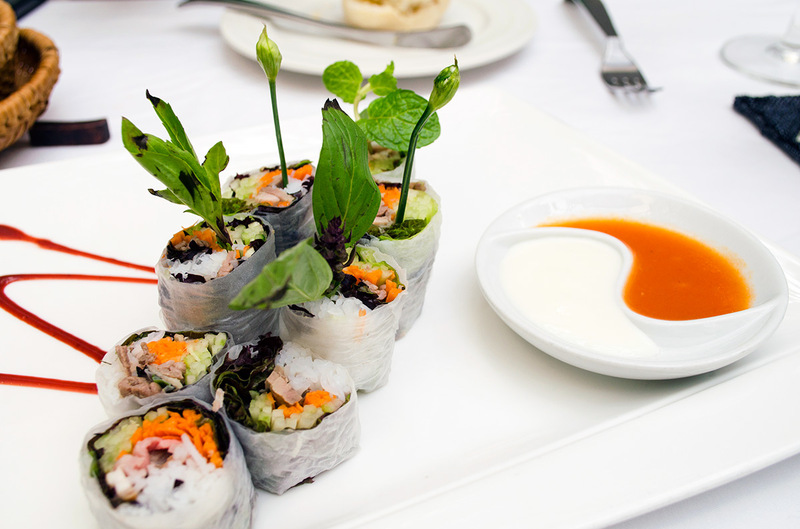 In popular areas vendors line the streets selling everything from grilled chicken on a skewer to hand-rolled sushi. One of our favorite staples was the simple, yet tasty, beef noodle soup. For less than a dollar, Leslie and I could both get a large bowl to ourselves that helped to satisfy our mid-day hunger. By eating a simple breakfast most days and alternating between restaurants and street vendors for lunch and dinner, the cost of food was one of our smallest expenses during our trip. On average we spent $22.04 per day on food, for a total of $815.49 for our five week trip. While we would have been content lounging on the beaches and wandering the streets of each city, Leslie and I decided to devote a sizable portion of our budget on activities. Our goal was to experience things we couldn’t back home in the United States. 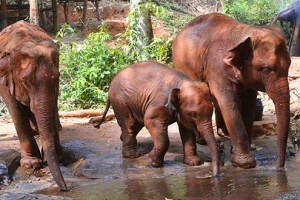 One of our favorite activities was spending the day at an elephant sanctuary near Chiang Mai, Thailand. For $67 each we were able to get up close with several elephants helping to feed and give them a mud bath. 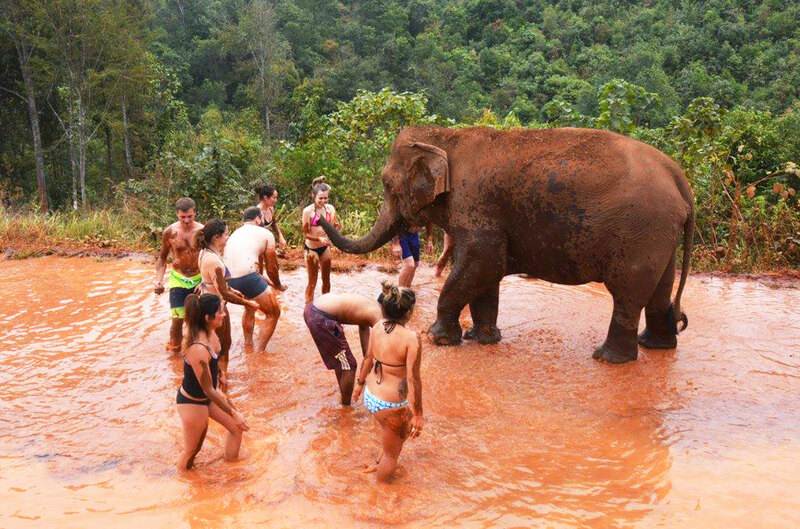 We highly recommend anyone who is planning a trip to Thailand to find the time to visit an elephant sanctuary (just be sure to do your research and pick an ethical sanctuary, we highly recommend Elephant Jungle Paradise Park for your trip to Chiang Mai). 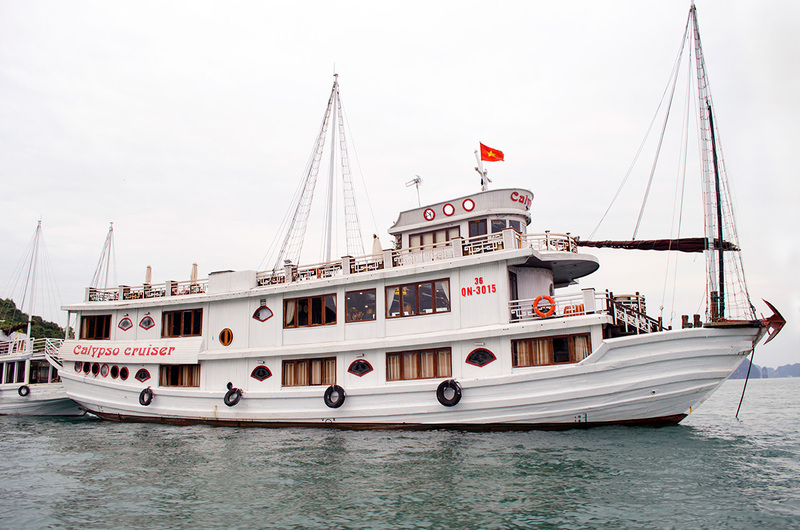 Another activity we enjoyed very much was booking a three day/two night cruise in Halong Bay, Vietnam, for Valentine’s Day weekend. 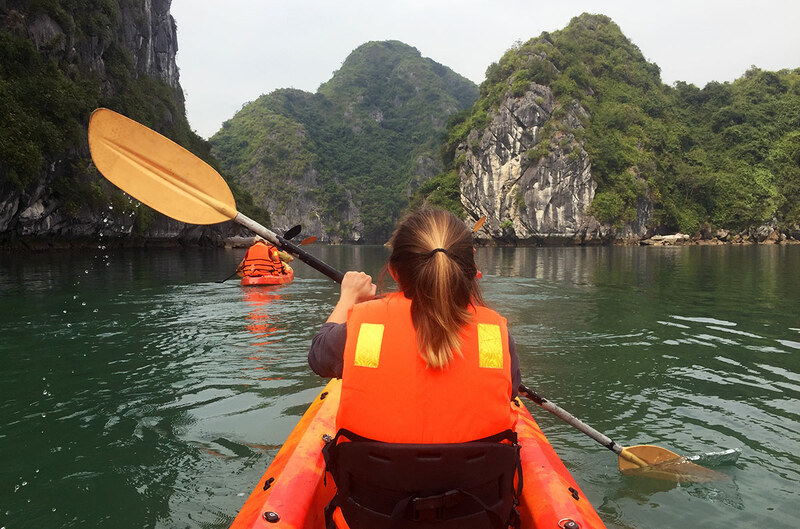 Over the course of three days we were able to kayak several times, relax on a private beach, take a cooking class, visit a pearl farm and explore a cave. While the cruise cost us $279 per day and ended up coming to $600 total (when you add in a happy hour onboard), the cost didn’t matter to us; because when you add it all up the experience was priceless. Don’t forget to keep in mind that this expense included accommodation, every activity, AND breakfast, lunch, dinner. 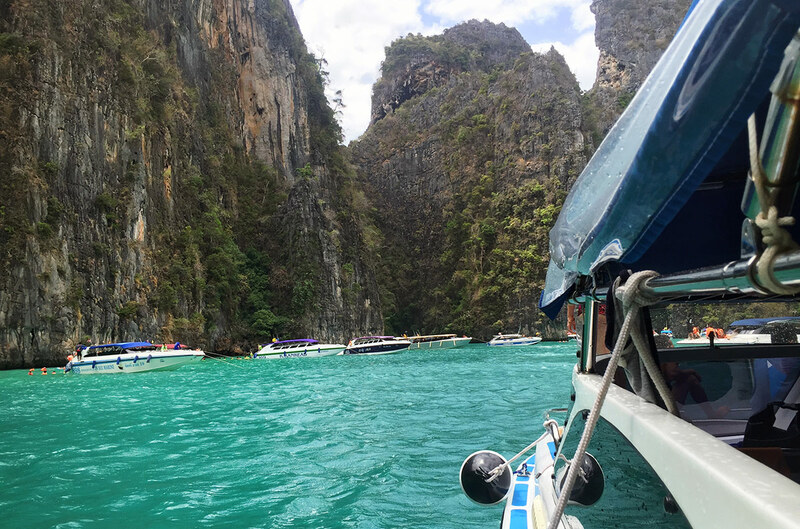 Another activity that ranks high among our favorite memories from Southeast Asia was a snorkeling trip we took while in Ao Nang, Thailand. Even though we decided to book a snorkeling trip last minute, we were able to find an amazing semi-private day trip to the Phi Phi Islands. Rather than sharing the speed boat with 30+ people, we were in a group of 13 people! We spent the afternoon snorkeling around Ko Phi Phi Don and swimming in the nearby lagoons. In the water we saw many different kinds of fish, including clown fish and the occasional Moray eel! 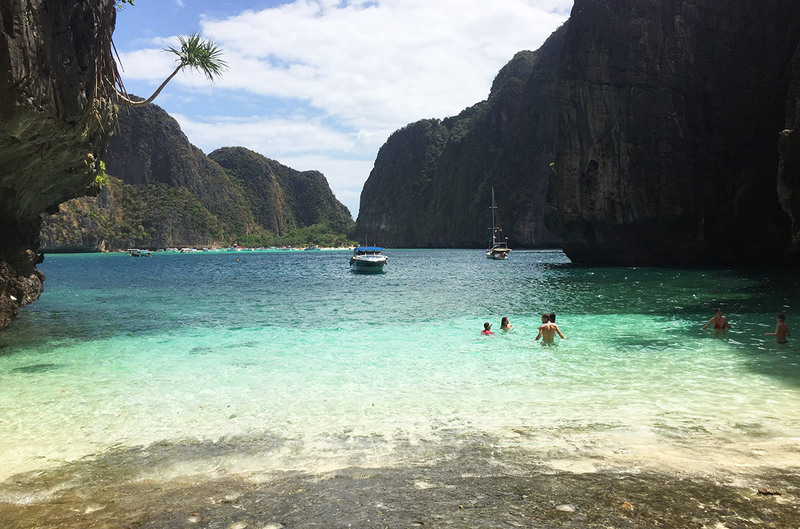 The day trip also took us to Maya Bay (where ‘The Beach’ was filmed) and Phra Nang Beach. For $90 each, our snorkeling trip with Thalassa Tours was well worth it. 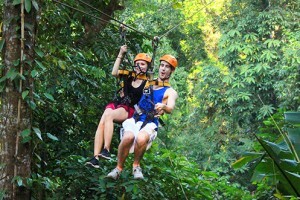 These were just a few of the activities we did during our five week Southeast Asia trip (we also went ziplining in the jungle near Chiang Mai). All together we ended up spending a total of $1,124.38 on activities. In addition to the accommodation, transportation, food, and activities, we also spent a good amount on miscellaneous expenses. This includes sim cards for our phones, a shopping spree on clothes at the beginning and end of our trip, and the handful of gifts/souvenirs we bought for friends and family. All together we spent an additional $792.11 on these miscellaneous things. Some of you might think that’s a lot of money to spend on travel. That’s fair. But keep in mind this is what we spent as a couple traveling together. And if the budget was a concern for us we could have spent a hell of a lot less. Rather than booking private rooms, we could have got bunks in a hostel dorm for a third of the price. We could have avoided flying and took overnight buses/trains instead. We could have also cut out a few of the more expensive activities. How much you spend on a trip to Southeast Asia depends entirely on you. The earlier you plan ahead and the type of travel you enjoy will effect the final cost of your trip. In the end, Southeast Asia is one of the most affordable travel destinations in the world. So, have you booked your flight yet? 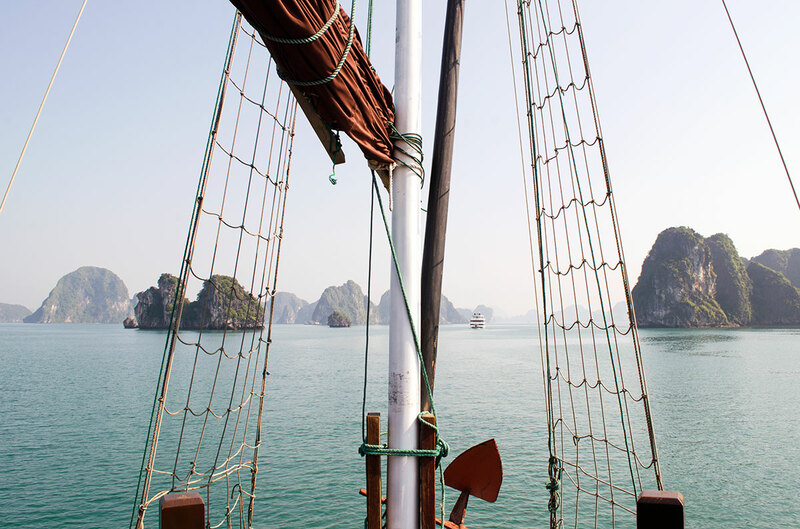 Have you been to Southeast Asia before? If so, how long did you stay and how much did your trip cost you? What year is this article..? Hey Amanda, our trip to Southeast Asia was from January 2016 – February 2016.